LAE looks absolutely beautiful from the air. The place is green, the air is fresh (as long as we don’t have a coal power plant), rivers run through to the Huon Gulf, as a sentinel of majestic mountains surround the city. Lae is truly the ‘Garden City’ of PNG, however, a lot more work still needs to be done on ground-zero to restore it to its glory days and bring back tourists. 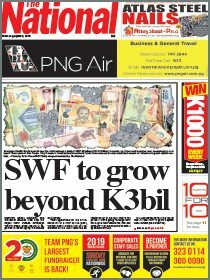 This can happen with the people of leaders like Morobe Governor Ginson Saonu, Tourism Promotion Authority chairman and Nawaeb MP Kennedy Wenge, and Provincial Administrator Bart Ipambonj, among others. TPA chief executive officer Jerry Agus has made a firm commitment to help develop tourism in Lae and Morobe. He needs the support of all Morobe leaders. Last weekend, while in Lae to attend the funeral of a family member at Butibam village, I also take a look around the city with an ex-Aiyura schoolmate and now civil engineer Kila Veapi. First and foremost is the stretch of the Lae-Nadzab Road between Yalu Bridge and 9-Mile. Sure, the first stage between Bugandi and 9-Mile has been completed, however, the stretch from 9-Mile to Yalu is a national disgrace. In town, while most urban thoroughfares have been completed, transforming “Pothole City” into “Cement City”, the Busu Road stretching from China Town to Malahang is falling apart. The stretch between University of Technology and Bumayong is something that long-suffering Lae residents are praying will be completed. There is also the dearth of recreational facilities in Lae for both tourists and residents. There has been much ado about reviving the Botanical Gardens, however, precious little has been done. This was once the premier botanical garden of PNG, a hub for tourists and visitors, however, this glory now goes to the Nature Park and the Adventure Park in Port Moresby. Renowned gardener, the late Andree Miller, would probably be turning in her grave at what the Lae Botanical Gardens are right now. Likewise, the Rainforest Habitat at the University of Technology in Lae, is a shadow of its former self. 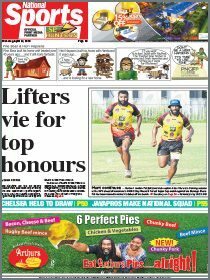 What Lae needs is a dedicated gardener, just like Port Moresby has Justin Tkatchenko, to get its parks and gardens rolling. Raun Wara, the lake opposite the Lae Show Ground, has so much potential to be developed into a recreational area for tourists and residents. People have been waiting for years and years for this to happen, however, no one seems to care. I fly my drone a couple of times over Raun Wara, taking pictures and videos, and am amazed at the beauty of the place from the air. There is no proper beach in the city itself. The beachfront at the end of The Esplanade, opposite the old airport, can be developed into a proper recreational area. Lae’s answer to Ela Beach. The large piece of land next to The Esplanade has been taken, in yet another case of land-grabbing, and it is the hope of residents that authorities will get back this land. Voco Point can also be developed into a proper recreational area if there is a will. Most of the Amelia Earhart Park, next to the old airport where the darling of world aviation disappeared after taking off in July 1937, has also fallen victim to land-grabbing. The Lae City Authority, if it does exist, also needs to ensure that markets in the city, starting from the Main Market, are clean and safe for both tourists and residents. Not filthy pig sties with people spitting betel nut and littering everywhere. Everywhere else in the world, markets are a major tourist attraction, something that has not caught on yet in PNG. Lae can change, however, people will need to change their attitudes, take ownership, and be proud of their hometown. People also need to be a lot more creative than just wasting time because it’s forever raining in Lae. At Wagang (Sipaia) village, one of the landowner Ahi villages, two major projects are happening. One is the Wagang Fisheries Port which is being funded by National Fisheries Authority at a cost of K800 million. The other is the proposed dumping of Wafi-Golpu mine tailings into the Huon Gulf from here. The fisheries project is located between Wagang and Bumbu Settlement. All this area will be cleared to make way for a major port, catering for fishing boats, which will rival the Lae Port Tidal Basin. In the village itself, it is planned for tailings from Wafi-Golpu to be piped here, and into the sea. Wagang Beach is one of the most-popular weekend getaways for Lae residents given lack of recreational facilities in the city. Surprisingly, the pipe will not go far into the sea, just 200 metres offshore at the mouth of the Busu River. Village elder and well-known former rugby league player, John Jacob, tells me that most villagers are now pro-pipeline. “Originally, with the tailings issue, a lot of people were against it,” he tells me as we watch the sun set over the Huon Gulf. “The company has been talking to us, telling us that this is a Government impact project, and they need that project to start. I stand at the beachfront, absorbing the beauty of the Huon Gulf, looking towards Finschhafen, Lae and across the Gulf to Salamaua. Wafi-Golpu tailings can forever destroy all these natural wonders that our forefathers enjoyed for hundreds of years. And the tourists won’t come.